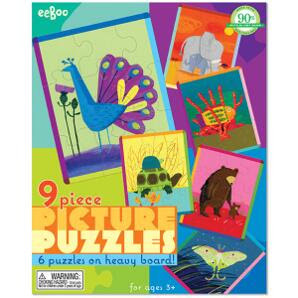 I've talked about eeBoo products before (and how much I love them) and yes, this is a pre-Christmas post to say, "When considering buying puzzles for young kids, consider eeBoo." And no, they didn't pay me to say so. They sent me a sample and I am impressed enough to have declined other offers of product reviews in favor of sticking with what I know to be a solid, good product. 1. 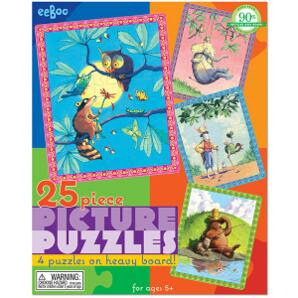 The variety of puzzles in the box. 3. They use non-toxic ink to print the pictures. 4. Their artwork is unique and inviting. 5. The pieces lock together very well and are very sturdy. Yet, for as sturdy as they are, they are not impossible to either put together or take apart. They are just right. 6. 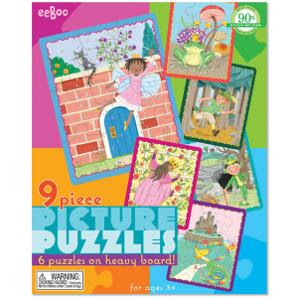 The puzzles are divided into sections within the box so that you do not mix up or confuse the puzzles with one another. They are organized very well for safe keeping, storage and to avoid tears of frustration in little ones. Mommy: "These puzzles are for when you are older." His powers of persuasion are still a bit lacking but I'm assured that he will love this next puzzle set equally well. There's nothing to dislike about them and everything to hope for when it comes to having fun. I will never buy another puzzle set from another company and I mean that. 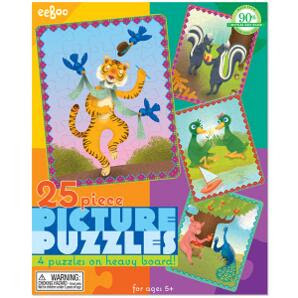 These make the best gifts and the most fun whereas beginning puzzles are concerned. I've had a few sets of floor puzzles from other companies, but none are half as well made or quite so artsy. Love these guys. 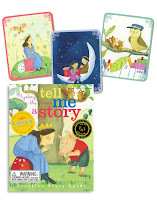 As a reminder, I reviewed the eeBoo Tell Me a Story cards over at 5 Minutes for Books. 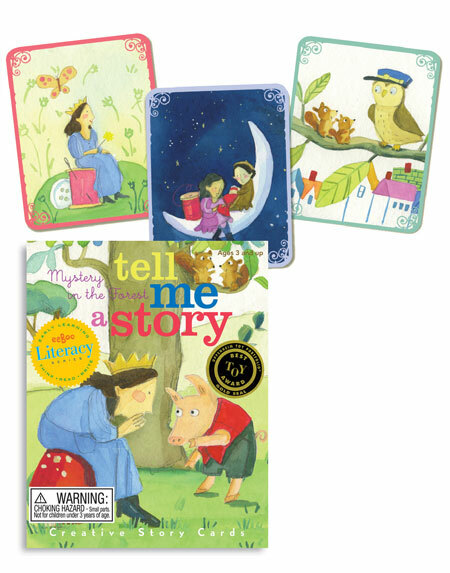 The artwork is consistent in all of their products and the Tell Me a Story Cards would make a great stocking stuffer alongside the puzzles. These products combined provide good fun and the ability to formulate imaginative stories involving animals and fairy tales in a way that my son really appreciates. Nobody has to twist my arm to say "eeBoo products rock" and that's the truth of it. I love eeBoo as well. I highly recommend the "Never Forget a Face" game. It's memory but with faces from around the world on each tile -- fabulous illustrations. I love, love, love Eeboo! Great product, great company. They truly are in a league of their own! I had not seen their puzzles before. Thanks for letting me know about them.